Why Is This Recovery Different from all Others? I have mentioned a couple of times in previous posts that I was working on a comparison of the anemic recovery from our Little Depression to recoveries from previous post-World War II recessions. The comparison actually involved getting my hands dirty with some data, doing some actual, but low-level, empirical work. My results seem interesting enough to share, even if they are not exactly the sort of thing that one would publish in an econ journal. The exposition may be slightly more technical than is customary for blogs, but I hope that some readers may be willing to at least skim through to the end to get a sense of what I have done. So here it goes. About two weeks ago while I was in the final stages of talking myself into starting this blog, I saw a short piece (in the weekend (June 24) edition of the Wall Street Journal) by editorial writer Stephen Moore, touting a report (“Uncharted Depths”) of the Republican staff of the Congressional Joint Economic Committee, purporting to show that, on every metric, this recovery is by far the weakest recovery since World War II. Disdaining any pretense of objectivity, Mr. Moore, in his second paragraph, highlighted the finding of the JEC report that employment is still 5 percent below what it was at the start of the downturn 38 months ago. “This,” Moore continued, “compares to an average rise in employment of 3.7% over the same period in prior post-WWII recessions.” But the latest downturn was both deeper and longer-lasting than any post-WWII recession. So for Mr. Moore et al. to compare, on the one hand, employment 38 months ago at the start of the downturn with employment now, and on the other hand, employment at the start of previous recessions with employment 38 months later, is to bias the comparison of the recoveries from the get-go. Obviously, if one downturn is deeper and longer-lasting than another, the ratio of employment (or any other cyclical variable) in the bigger downturn a given length of time after it began relative to employment when the downturn started will be less than the same ratio in the smaller downturn even if, once underway, the recoveries are equally strong. But, obviously, the point of the exercise for Mr. Moore and the authors of the JEC report was not to perform a fair and balanced comparison; it was to inflict damage in a political battle. Nevertheless, their bias notwithstanding, Mr. Moore et al. had the germ of an interesting idea. So I decided to try to redo their comparison of recoveries from post-WWII downturns, while also taking into account the length and severity of the downturn preceding the recoveries. So for each of the 10 stand-alone downturns (i.e., excluding the 1980 recession, overtaken a year and a half after it began by the steep 1981-82 recession), I took the peak quarterly real GDP at or before the downturn and real GDP 13 quarters after the downturn started. (After the 1957-58 downturn, another recession started 11 quarters later, so I compared the peak quarterly GDP before the downturn with peak GDP 11 quarters later.) I also calculated the difference between the peak quarterly GDP before the downturn and the lowest quarterly GDP after the downturn, as well as the percentage of months in which the economy was in recovery for each (with the above-mentioned exception) 14-quarter downturn-recovery cycle. So I amassed data for the following 10 post-WWII downturns and subsequent recoveries: 1948-49, 1953, 1957-58, 1960-61, 1969-70, 1973-75, 1981-82, 1993, 2001, 2007-09. 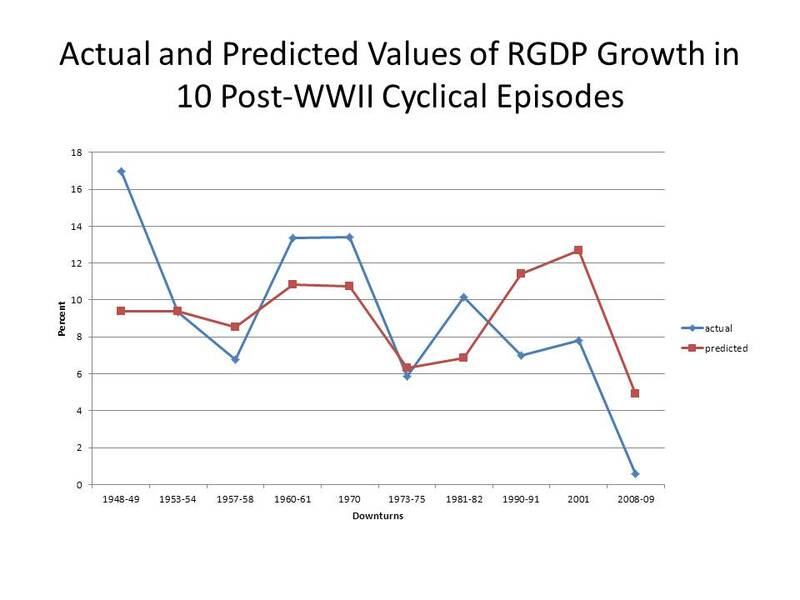 The data consisted in the percentage increase in real GDP 13 quarters after the start of each downturn over the peak GDP at or before the downturn, the percentage decline in real GDP at the depth of the downturn from peak GDP at or before the downturn, and the percentage of each downturn-recovery cycle (measured in terms of months) in which the economy was recovering. The r-squared of the regression, measuring how much of the variation in the increase in real GDP is accounted for by the regression, is .855, which is not too bad, actually. Using the regression coefficients, I calculated the implied increase in GDP 13 quarters after the start of each of the 10 recessions and plotted those predicted values against the actual values in following chart. What is noteworthy about the chart is that although the current recovery is obviously the weakest of the 10 post-WWII recoveries, it is not, contrary to Mr. Moore and associates, the worst post-WWII under-achiever. Relative to the depth and duration of the earlier recession, the current recovery is no worse, perhaps even slightly better, than the recoveries from the 1990-91 and 2001 recessions. The other under-achiever, as one might have guessed, is the truncated recovery to the 1957-58 downturn. Now it also occurred to me that some other factors might also help account for the variations in the strength of the recoveries to post-WWII downturns. The most plausible or most interesting ones that I could think of were the rate of inflation (of course) and the tax rate. There are multiple ways to measure these variables, but, for purposes of this exercise, the GDP price deflator and the top marginal tax rate seemed the most informative and relevant. But a moment’s reflection is enough to make it obvious that it isn’t even worth trying to estimate a regression with the top marginal tax rate as a variable; the top marginal tax rate, having started at about 90% percent in the late 1940s, falling to 70% in the 1964 and to 50% in 1982, 39.6% in 1993 and 35% in 2003, clearly tends to be positively correlated with the strength of a recovery, the weakest recoveries having all been registered when the top marginal rate was lowest and the strongest recovery (to the 1948-49 downturn) when the top marginal rate was at its maximum. Hardly anyone would believe that there is a causal link between high tax rates and strong recoveries, so the observed correlation is, somehow or other, either purely random or coincidental, with some other, as yet unspecified, variable. Nevertheless, the strong apparent correlation between high marginal tax rates and strong recoveries ought to suggest to those who argue that low taxes will solve any problem, that they may be overstating the miracle-working powers of low marginal tax rates, at least as a method of promoting cyclical recoveries. Even the powerful recovery from the 1981-82 recession, when that famous tax-cutter Ronald Reagan was President, coincided with a top marginal rate of 50%, a rate that would now trigger howls of outrage from Reagan’s present-day acolytes. But it did seem worthwhile to reestimate a regression including a variable for inflation. In each downturn-recovery cycle, I compared the GDP price deflator in the last quarter of the downturn with the GDP deflator 13 quarters after the downturn started. Doing so isolates inflation in the recovery, because I want to know if greater inflation is associated with a stronger recovery. Taking the overall increase in the GDP deflator during the recovery, I calculated the implied annual rate of inflation over the entire recovery and estimated the regression using the natural logarithm of the average annual rate of inflation during the recovery. I used the logarithm, because additional doses of inflation might well have a declining stimulative power, implying that the logarithm of the inflation rate would give a better fit than the inflation rate itself. In fact, estimating the regression both ways, I found that, as expected, the logarithm of inflation gave a better fit than did inflation itself. The equation says that the percentage increase over the whole cyclical episode can be broken down into three components. The first two are as they were previously, but with somewhat reduced coefficients. The third component is 2.75 times the logarithm of the rate of inflation, which implies that a 1% increase in inflation was associated with an increased real GDP growth over the cycle of somewhat more than 1%. The r-squared of the new regression is .881. The adjusted r-squared, which takes into account the number of variables, rises from .82 with no inflation variable to .83 with an inflation variable. Not spectacular, but still respectable. As before, I also calculated the predicted values for real GDP growth in each cycle and plotted them against the actual values. Those plots are in the chart below. It is apparent that adjusting for the rate of inflation makes the current recovery seem a bit less of an under-achiever than when no account was taken of inflation. In the previous chart, the current recovery performed only slightly less well relative to the prediction than did the recoveries after the 1990-91 and 2001 recessions. In this chart, it does noticeably, though not very much, better than did the two previous recoveries, and also better than the 1973-75 recession (which makes sense inasmuch as inflation in that recession was driven largely by supply-side, not demand-side, factors). What is the point of all this? Well, with only 10 observations, one would hardly want to put much reliance on any statistical result, so the main lesson is negative. Although the current recovery is certainly very weak, in the sort of naïve comparison that Stephen Moore and associates were performing, the current recovery is actually less of an under-achiever, given the length and depth of the preceding downturn and the very low rate of inflation, than either of the previous two recoveries. To put a slightly finer point on it, if the rate of inflation in the current recovery had been equal to the rate of inflation in the recovery from the 1981-82 recession when Ronald Reagan was President, the corresponding increase in the predicted rate of growth would have been 3%. According to Okun’s Law, adding 3% to real GDP would reduce the unemployment rate by 1%. Do the data prove that that is what would have happened? By no means. Correlation is not causation. But perhaps Mr. Moore and associates, so quick to draw conclusions from a simplistic, if not simple-minded, comparison of this recovery with earlier recoveries, should entertain the possibility that the data, apparently so compelling, may be telling a different story from the one they thought they were hearing. Even before reading, let me get you going in pasting graphs onto the post. Do the graph in Excel (personally I prefer doing them in EViews). Then paste the graph onto Power Point. Choose “select all” and click on “copy”. Then open “Accessories” in “All programs” and choose “Paint”. Paste the graph and choose “file”. Choose a name for the graph and click “Save as” It will save as .jpg in your “Images” directory. To paste onto the post click on the first button (rectangle – “add an image)) in the top of the post and follow the instructions. Hope I´ve helped! While I greatly enjoyed all your other posts, this one was a “let down”! The argument is convoluted and regression results rarely convince. Without a doubt, this is the worse recession/recovery of the post war period. If for nothing else, its the only one where NGDP turned negative and significantly so. I agree with the above commenter, this post and your blog in general would be greatly strengthened by including your charts within the post. Also: “Hardly anyone would believe that there is a causal link between high tax rates and strong recoveries”. I know a man that would – Mike Kimel at presimetrics.com/blog/. He postulates that higher top income tax rates encourage higher investment and thus higher economic growth. I haven’t gone through the data thoroughly enough, but it’s an interesting and outside the box idea. Marcus, First of all thanks for the tutorial. I will try to revise and edit tonight based on your instructions. As for your second comment, well, I guess nobody is perfect. I may have made to big of an effort to prove what shoud be obvious to intelligent people, that much of the professional right wing economic commentary has gone off the rails in its effort to discredit Obama and everything now associated with him including the Fed. At any rate, it kept me busy for two weeks trying to come up with regression results that made sense. So I was feeling good about that, but the return on my investment may not have been as great as I hoped. C’est la vie. Basil, I would have included the chart if I had known how, but with Marcus’s help I hope to fix it later this evening. All I meant, and I tried not to make a categorical assertion, is that there seems to be fairly strong intuition supporting the notion that reducing the top marginal rate would be stimulative. If Mike Kimel, with whom, I am not familiar has an argument for why raising the top rate would be stimulative, then I would have to go through his argument before I could comment further. Thanks for the reference to his blog which I will try to look at. The mess started before Obama came on board. I simply ignore the so called “analysis” coming from “political operators”. We are in agreement. But sometimes a target seems too tempting to resist. The “political operators” are full of “tricks”. The problem is that if you try to “counter trick” them you can get into problems. Best to ignore and do your own thing. Yes! I did it! Thanks so much. Not surprised by your choice of emphasizing top income tax rates…that is typical of people who want to ignore the fastest growing taxes. I’d love to hear your theory about why increasing regressive payroll taxes has been so great for the economy over the last 60 years. It is funny how the pro-government central planner types first argued that the economy is better now than ever…and then when forced to admit it isn’t…they ignore the growth in central planning/government/and many forms of regulation/taxation as explanatory variables. Just eyeballing the graphs, I was struck by the fact that there appears to be some time dependance in the errors. 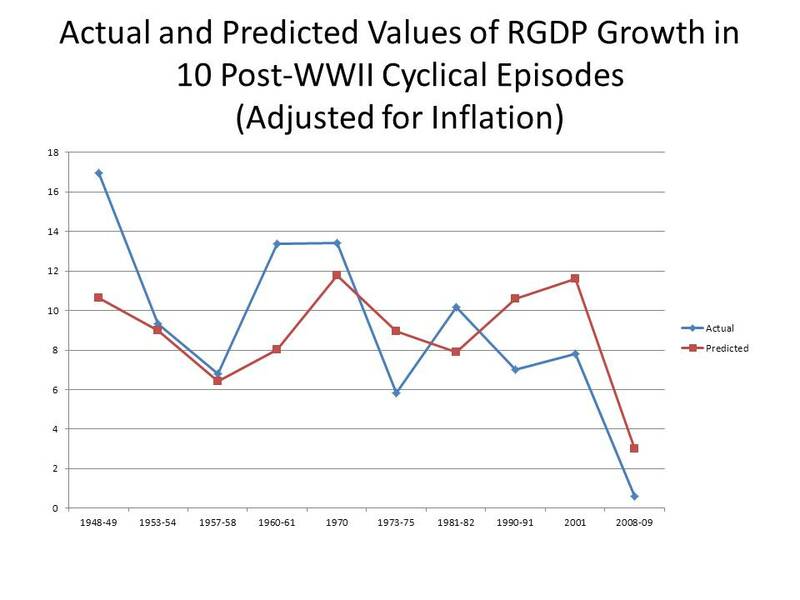 In the graph of actual and predicted values adjusted for inflation, the RGDP growth after the first five recessions is underpredicted, while growth following the last three is overpredicted. Whether this is caused by tax rates or some other variable is hard to say, but but it does seem striking. Your thoughts? Gabe, My little econometric exercise was not meant all that seriously. I was mainly trying to make a point about the sloppy and tendentious reasoning of Stephen Moore and the authors of the JEC report. I brought up taxes, because Moore et al. are so focused on the importance of marginal tax rates in explaining the performance of the economy. I really haven’t thought about the effect of payroll taxes on the economy, so I have no theory about whether overall it has been good or bad for the economy. Stewart, I noticed the same time dependency that you did, which was the point of my comment about tax rates. That was directed at Moore et al. for whom it is really anomalous. But I have no theory of my own about it. I want to disavow the comment I made above, back in the day. Extremely flawed and silly all around. Apologies.